I did a few things today after work that I don’t normally do. 1. I put on a bikini without too much thought other than will children be at the pool. I’m feeling really good about my size and after about three weeks of tracking with just my journal I’m feeling confident in my foods choices – both the food and the amounts. I’m not really eating much differently, I’m just not tracking it like I had been. 2. I went in the water. I get it, that’s what the pool is for, but at the same time it it’s a big accomplishment. I remember the first time I put on a swim suit after I had lost about 50 or 60 pounds. I was at Lake Tahoe and I loved my tankini, but I was still very aware of my body. The top piece had so many ruffles because I thought that could hide me. The next time I worked a bikini, it was when I stepped on stage for the first time and I was down about 30 pounds lighter. It’s gotten easier to wear a swim suit, but remember swim suit is so different than stepping on stage. On stage, you play a part. So getting in the water today felt like a big deal. I went in the pool three times. I brought a book down with me and to help cool down and break up the reading I went for a dunk and walked around a few laps. 3. I left my phone in the apartment. After a busy week, and the first week in five weeks that I’ve forced myself to not work outside my office hours (I’ve put in almost 40 hours of overtime collectively which is a lot since I am scheduled for 20 hours a week), I was exhausted after reading and responding to 45 emails first thing in the office and an additional 30 during the day for the project I’m on. In the grand scheme – that’s not a lot of emails, but I’m in the office from 8 am to 1 pm. I had some technology overload and needed a break. Aside from responding to a few clients this afternoon, I’ve left my phone alone for the most part. 4. I laid outside and got a tan for an hour and a half while reading and then eventually napping by the pool. I wore sunscreen, but I’m happy my legs saw the sun. The difference from my upper body to my legs is quite sad. The first time I went in the water, I realized that the 12 other women weren’t near the water and 11 of them were on their phones – one was also reading a book. I know I’m guilty of this – of being attached to my technology. But not having my phone or computer near me heightened the realization that I didn’t have them with me, when I realized almost everyone else did have them. For once though, I didn’t feel like I was missing out on anything by not checking email or social media. I won’t lie, it felt weird. But since there wasn’t anything I had to do today after work, I wanted to give myself some time to relax. The book I’m reading was purchased after watching a TED Talk by the author about the use of technology and a generations inability to ever become bored and how boredom can help with creativity. It’s really an interesting idea. As kids when we were bored we would go outside and imagine magical worlds – we’d get creative. As adults, we don’t really go outside to play, but I guess a walk or exercising or watching a movie could fill that void. However, these things don’t always spark creativity. In some cases, they fill the void by providing us with mindless entertainment that takes minimal thinking. I honestly do my best thinking in the shower. It’s when I’m alone and no one is bothering me… however, there are times that JP thinks it completely okay to poke his head behind the curtain and scare me. I use the hot water to help me figure out how to plan out the day, I use it to help me figure out how to reduce my stress. I’ve had some anxious moments in the shower and it took a little longer to figure out my next step, but I eventually did. While I’m not truly getting bored in the shower, I do find that I’m in an environment that is supporting clear cognitive processes. 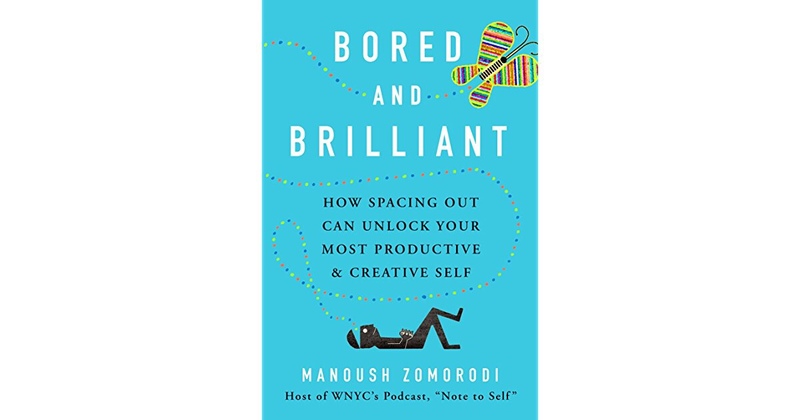 So, this TED Talk, this book, the author – Manoush Zomorodi, discuss how being truly bored can help you unlock your most productive and creative self. Manoush argues that with technology we never have a chance to be bored. Essentially we are always turned on and engaging in some way – so it’s possible that the new generation doesn’t know the feeling or emotions that come with being bored or true enjoyment. When I think about my personal use of technology, the first thought that comes to mind is how I utilize my phone and encourage some of my clients to do so as well. It’s readily available most of the time, so use the calendar, set alerts or reminders. I don’t have to pencil you in, give me a second and I’ll type you in. I’ve got this thing programmed, I’m scheduled and I know where my free time is. I know when I’m going to the gym and when I’m settling down for the night. Think back to 2009/2010ish – do you remember when Apple said, “there’s an app for that”? It’s because there is and if there’s not, it’s not difficult to make one. I have a handful of apps on my phone that assist with my fitness goals. Not only my Fitbit to track my steps, but also timer applications so I can incorporate intervals into my training and calculators to determine ranges and maximizing my lifts. I do carry a journal and pen with me, but information at the tips of my thumbs and pointer fingers is so appealing. I tracked my food for four years using My Fitness Pal. These are great tools, but it wasn’t until I stopped using My Fitness Pal that I realized how routine it had become and how it wasn’t necessary for me at this point, right now. If I think back about how I’ve utilized these tools, they were the best resources I had and I wouldn’t have been able to progress like I have without them, but new goals, new methods. The positive and not-so-positive connections I’ve made online have shaped me and my journey. I wouldn’t have started competing had I not seen other women doing it and crushing myths I had believed about lifting online. I wouldn’t have started coaching if people hadn’t asked me to consider it after hearing my story online. I wouldn’t have gone back to school for public health if I didn’t have access to research databases that got me interested in health and nutrition along my journey. I wouldn’t keep taking risks if I didn’t think it was worth it in the end. But I’ve also seen how admiration and jealousy can be overwhelming and encourage unhealthy competition and comparison. Technology is a double-edge sword in this regard. There are times when this reality is tough and the idea of running away even if it’s briefly sounds perfect, but I think my purpose for technology outside of my health journey in the traditional sense, is for connection on my own terms. Which I guess then meditated connection allows for a quick escape in either direction. When you need to recharge, it’s easier to step away from your phone than it is to disappear at a party – I’ve done both. Her talk, the book – go deeper into how disconnection can lead to boredom, and how we shouldn’t fear it because it has the potential to spark our creativity. I would argue it’s more than our creativity, it’s self-discovery, which may be intertwined. So this afternoon, I found myself at the pool disconnecting from technology, hoping to people watch and maybe talk with someone, instead I found myself more disconnected than desired, which was slightly terrifying because I felt my mind wandering more than I felt it should, but it got me thinking. I can’t help, but be connected, but if I can be more intentional about setting aside time for myself to disconnect occasionally and allow my mind to wandering intentionally, it won’t be so shocking when I’m alone near the pool by a dozen strangers. Do you remember the last time you were bored?